Be sure your companion animal is in good health and has all his or her vaccinations. Keep a recent health certificate and rabies certificate on hand and make sure your cat or dog is wearing identification that includes your name, address, and phone number. When packing, don't forget your companion animal's food, food and water dishes, bedding, litter and litterbox, leash, collar and tags, grooming supplies, a first-aid kit, and any necessary medications. Many hotels now welcome companion animals, but others do not. Be sure to check their policies in advance. Carry a current photograph of your cat or dog with you. If your animal is lost, a photograph will make it easier for others to help you locate him or her. Ideally, you should have your veterinarian microchip your animal. Microchipping is without question the best way to ensure that a lost dog or cat will be reunited with you. In Israel, microchipping is required for all dogs when they are given their first rabies vaccination. Take your cat or dog along in the car when he is young, so he will get used to traveling. Put your cat in a plastic, canvas, or metal traveling carrier, fastened by a seat belt. Consider using a crate with padded fabric for your cat, instead of a plastic or wire crate, to provide additional safety in case of an accident. Dogs don't usually need a carrier, but if necessary and possible, secure your dog with a restraining harness. Take care that your companion animal does not get dehydrated. Take along ice cubes to lick, which will not upset your cat or dog's stomach as much as large amounts of water. Keep feeding to a minimum during travel. Stop every few hours to let your dog walk around on a leash. Even if you don't expect to need it during the journey, always be sure to have a leash in a convenient spot in the car. Take along plastic bags to clean up after your dog. Never leave your cat or dog unattended in a car. On a warm day, your car can heat to 49 degrees Celsius (120 degrees Fahrenheit) in minutes, even with the windows open enough for fresh air to enter, causing brain damage and even death. The problem is so serious that in some areas the police and animal control personnel are authorized to break the window of a car to rescue an animal on a hot day. In Israel, animals are permitted on trains and buses. On trains, dogs ride for half price. Cats ride free. Companion animals are also allowed on many buses, for an additional charge. Cats must be in a carrying case and dogs must wear a leash and muzzle. 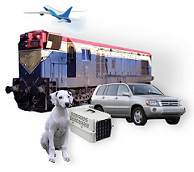 Some larger train and bus companies in the United States, such as Amtrak, do not accept companion animals. Check with the railroad or bus company you plan to use to ask if it permits animals on board. You may be able to find out a country's legal requirements through your veterinarian, on the Internet, or by contacting the consulate or embassy of that country. If your traveling companion is a cat or small dog, most airlines will allow you to take the animal on board for an additional fee. Check with the airline to learn their regulations, and book a space for your animal as far in advance as possible. Some airlines allow only a limited number of animals in the passenger area of the plane. If you have a choice, avoid putting your dog in the cargo area of the plane. Some animals are injured or die each year in transit, and almost every major airline has been fined repeatedly for violations of the U.S. Animal Welfare Act. Some animals become frightened, escape from their carriers, and are never found again. Upset nerves from turbulence can cause heart attacks, and the lack of oxygen in the cargo area can be fatal. Be aware of the difference between bringing an animal as "baggage" on a flight accompanied by a passenger, and sending an animal unaccompanied, as cargo. On a domestic flight, the difference can be minimal. However, on an international flight, because of customs and other required procedures, the process of collecting the animal is likely to take several hours. Do not feed your companion animal for at least six hours before air travel. Small amounts of water can be given before the trip. Make sure you have an airline-approved shipping crate/kennel. Expensive crates are constructed of heavier fiberglass, and they have stronger doors that will not open accidentally. Your dog should be able to stand, turn around comfortably, and lie down in a normal position. Your dog will feel more comfortable if she has a chance to get used to the crate before the flight. The crate must be appropriately labeled with "TOP" clearly written on the top, "LIVE ANIMAL" stickers on all sides, feeding instructions, and water and food bowls attached to the door. Attach a travel label to the carrier with the animal's name, your name, permanent address, telephone number, final destination, and where you or a contact person can be reached as soon as the flight arrives. Use direct flights and travel on the same flight as your dog or cat. Try to actually watch your companion animal being loaded and unloaded into the cargo hold. If possible, fly with an airline that has special handling available for companion animals. If your dog's regular collar can get caught in the carrier doors, replace it with one that cannot. Put a permanent ID with your name, home address, and telephone number on this collar. Be sure to choose flight times that will accommodate temperature extremes. Early morning or night flights are better in summer; afternoon flights are better in winter. Do not transport your dog when air traffic is heaviest, such as on holidays. Make sure your dog's nails have been clipped to prevent them from getting hooked on the carrier's door and other crevices. Do not ship pug-nosed dogs in cargo holds. The short nasal passages in these breeds leave them especially vulnerable to oxygen deprivation and heat stroke. When you arrive at your flight destination, open the carrier as soon as you are in a safe place, to make sure your cat or dog is all right. Make certain to have a leash and secure collar or harness with you at landing, because most airports require that the animal be removed from the carrier at the security screening checkpoint so the carrier can be sent through the x-ray machine. If anything seems wrong with your dog or cat after the flight, take him to the veterinarian immediately. 2 International Air Transport Association, Live Animal Regulations, 27th ed. Montreal: IATA, 2000. 3 Renée Bergeron, Shannon L. Scott, et al, "Physiology and behavior of dogs during air transport," Canadian Journal of Veterinary Research, 2002 July; 66(3): 211–216.